NBEC69 taped three ex-QRC SD40 units leading the train through Rimouski, Quebec in the morning of Saturday December 27. NBEC 6901, CFMG 6906 and NBEC 6905 provided the power. Dave Dineen got out to tape NBSR 2317 West in the dark and wet last night. It had 2317, 2610, 2318, and 9801 pulling 58 cars. Brian Barchard sent along this very nice winter photo of CP 1848 and 1832 in South Devon, Fredericton. Thanks, Brian! Here are a few photos I picked from my photo gallery that show trains in the snow. I found this great video of VIA 602 plowing snow in Quebec by PhotosMaxMar... enjoy. Kevin Gaudet posted a few videos of trains in the snow. I think the best is VIA 15 at Memramcook yesterday evening. Earlier yesterday in Moncton, CN 405 arrives, and later its power rolls out of Gort toward the fuel stand. Chris Mears sent me some photos of the snowplow that Smurfit Stone used to own in Bathurst. These were taken back in August 2006, when the mill was shut down but before the plow was taken away. Thanks, Chris! The snowplow is ex-CN 55121, built in 1916 by CC&F as CGR 295542. Here's a photo I took of it back in July 2002. I won an old Canadian National Railways (CNR) ad on eBay recently, and it arrived yesterday. The ad is for "French Canada's romantic Gaspé - Just like a trip abroad"
Towering cliffs thrusting into the Gulf of St. Lawrence. Fishing hamlets tucked into snug harbors. Percé Rock and Bonaventure Island, famed bird sanctuary, rising sheer from the sea (above)... Let us arrange your 550-mile conducted motor tour around the Gaspé Peninsula. You'll discover why people return to this magic spot year after year. Plan your trip now; ask your nearest Canadian National office or Travel Agent about this, or the other Top Vacations listed. "We'll tell you where and take you there." Reader Yan Bosse sent in some photos of a westbound CN train yesterday (Saturday Dec. 13) at Siegas, NB (near St. Leonard) and at Rivière-Verte nearing Edmundston. The train had CN 2276, 5683 and 2632. I would guess by the time (around 13:30) and the freight cars that it was CN 305. Al in Vancouver sent me a couple of winter photos of CN's Salmon River trestle in New Denmark, near Grand Falls. Here is his description. I grew up in Saint John, Campbellton and Fredericton during the 1960's and 1970's then moved away to the west coast. I thought I knew something about trains in NB but then I discovered Steve's site and have been hooked ever since. 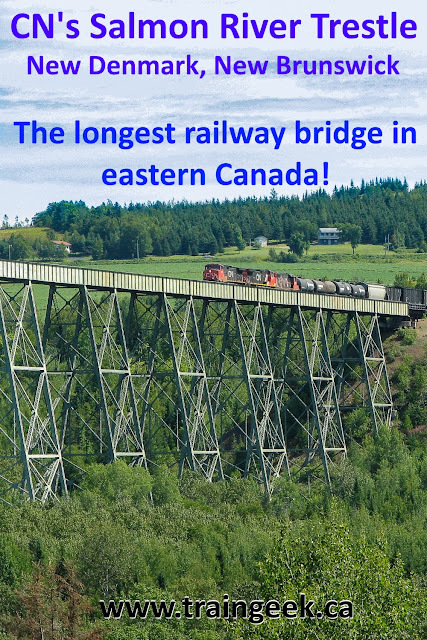 One thing that surprised me was the Salmon River trestle - I saw a photo and could not believe it was in NB !! I return to NB occasionally to visit family in Fredericton, so I have been looking for a chance to go see this structure. Earlier this month, the opportunity arose and I saw it in person for the first time. Let me tell you... photos cannot portray the scale of this trestle! You need to see it in person! I think the route I took was a good way to experience it... I took Foley Rd. north off Hwy 108 at New Denmark. Less than a km up the hill, just before the railway crossing, is the Valhalla Restaurant. It serves awesome home cooked food and has some historic photos of the New Denmark station circa 1939 as well as CNR 5527 Type Pacific 4-6-2 Hand Fired Passenger Engine that apparently was used on the Moncton - Edmundston run. The restaurant is in an old building which I believe is shown in another old photo with some rolling stock. Looking south along the tracks I could see an impressive trestle less than a km from the crossing, which at first glance I thought might be the Salmon River trestle. I continued north along Foley Rd. It wasn't long before I was greeted with my first vista of the (unmistakeable) Salmon River trestle. A picture is worth a thousand words but I have to say you need to see it in person. I continued down to the right, then left and across the Salmon River at a single lane army bridge, then left again and eventually passed under the trestle. All along the route are nice vistas - this is beautiful country. If you have never seen this in person, I draw your attention to the size of the telephone poles in the photos.... this gives an idea of the scale. It is deceptive to judge scale by various buildings in the photos as some are huge barns that look like small houses from a distance. It is a little off the beaten path (Trans Canada Hwy) but well worth the trip. I'd like to return in summer and stay at a bed and breakfast in the area. My only regret is that I did not spot any trains during my visit. This will be my excuse to go back! I periodically remind Steve to give me a heads up on any Via diversion over the Napadogan sub. 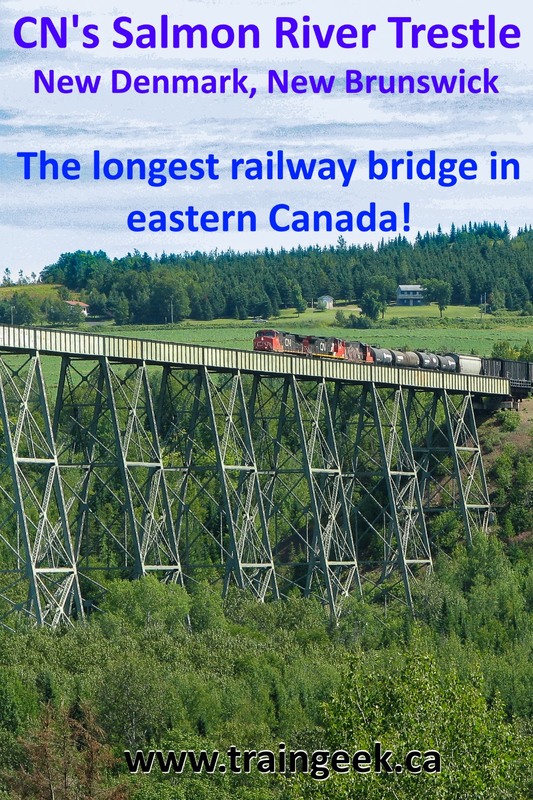 I would love to ride over this trestle; adding this to the memories of wigwags in Moncton and Campbellton during the 1960's, my cab ride up the Matapedia Valley in the early 1970's to 8mm movie and my RDC ride into Fredericton station during the early 1980's. Happy Holidays and all the best for 2009. PS Steve here - you may wish to read my post Bridges of Victoria County for more information on this and nearby bridges. PPS I was sent a few older photos of the Salmon River bridge.. I found an article in this morning's Le Soleil about a potential project in the Gaspe peninsula. My French is not good, but it appears that NGL Supply and Gaz Propane Rainville are looking at putting a propane terminal in Sandy Beach. This is basically at the end of the Gaspe rail line in the town of Gaspe, where port facilities already exist. It looks like it will be headed to an environmental assessment, for implementation in 2010-2011. The article talks about traffic of about 3,000 rail cars per year, which would be great for the line. Matt invited me to go up to McGivney early this morning prior to going to the Fredericton model train show. I thought this was a great idea, and hit the road at the wee hour of 05:41. Precisely 40 minutes later I was pulling up next to Matt's car. The signals were green over red facing east and we were expecting CN 121 at any moment. We spoke for a few minutes and then we heard the rumble of approaching engines. At 06:30 CN 121 blew through with 4 engines leading 103 cars. My video camera has a night shot mode. If you look at Matt's video, you can see a slight difference from mine, but I wouldn't say it made a huge difference. It's still dark! After that, we retired to my car and I bored him with photo albums. ;) At about 07:30 a CN hi-railer pulled up and the crew went into the depot. Normally the MOW crew only works Monday-Friday, but new this winter CN will have 7 days/week MOW coverage. Hopefully that will keep the trains on time! Matt knew one of the sectionmen, and they were very friendly and told us we should expect CN 305 after 09:00 and nothing after that for quite some time. A big shout out to Tim and Frank! Sure enough, by 09:00 we were told CN 305 was past Bantalor. Matt and I set up in the field and waited, and at 09:05 they rolled past with CN 2655, 2569 and 5385 for power. They had a very interesting load right behind 5385. The crane is owned by Amherst Crane Rentals of Scarborough, Ontario. I wanted to get a side shot since the sun was still low in the east, and by shooting fairly side-on the sun would not bother the video. I quite liked how it turned out with the glints off the cars. Matt took a more oblique shot. I think his video is sharper than mine. After 305 got the rollby inspection, the CN crew got on the rails and headed west. Matt and I packed up, and headed for the train show. It was a good morning. Danny McCracken was kind enough to pass along a few winter photos of CDAC 40, a GP40 leased by NB Southern back in the late 1990s. Here it is in McAdam on January 10, 1998 with ex-CP plow 401017. On May 12, 1998 CDAC 40 was leading NBSR 3700, 3787 and 3735 at McAdam. According to my records, CDAC 40 went off lease in 2003. Thanks for sharing those, Danny! Nicolas Kiss reports that SD75I units CN 5705 and 5703 have been the power on CFMG 402/403 for the past couple of days. He reported that CN 2660 brought a rail train into Campbellton just after midnight on Dec. 2. Also, he said GP40-2L(W) CN 9513 was tucked in behind the two SD75Is early yesterday morning. Rumour has it that the GP40s will replace the RS18s on the Brunswick Mines - Belledune run.